♦Riding Lessons - Lessons are available Tuesday through Saturday. A private lesson is required for the orientation lesson. This costs $45 and lasts one hour. After that lesson, the student may enter a group class or continue taking private classes. Children must be 3 years old to begin taking private lessons and six years old to join a group. Adult lessons are offered as well. Classes are offered on either a weekly basis or every other week. Group lessons taken every week include four lessons per month and cost $100. Group lessons taken every other week include two lessons per month and cost $50. Two to six students may be in a group class. Each lesson/class lasts one hour. Private lessons cost $25 for thirty minutes and $50 for an hour. Parents are welcome to stay and watch the lesson from the porch of the barn, or they may choose to drop the student off. If dropped off, please be on time picking up the student as we cannot adequately supervise the student after the class is over. 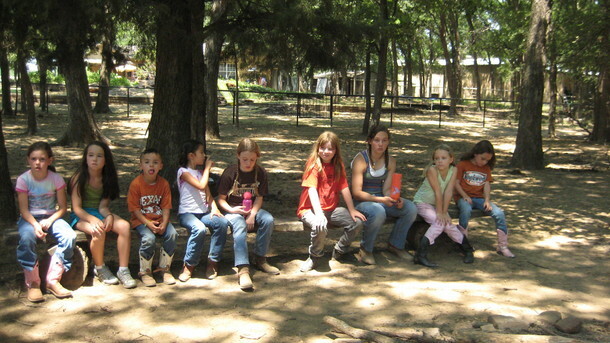 ♦Parties - Four Fillies Farm hosts many parties every year including birthday parties, Girl Scout certifications, small family reunions, school groups, company picnics, and church groups. Rates begin at $200 for two hours and 12 people. Prices increase for larger groups. Call for more information. ♦Training - All horse training is done by Chuck. His specialties are green breaking two year olds and correcting bad habits older horses have formed. Other problem areas can also be addressed and worked on. Training fee for one month for one horse is $450. 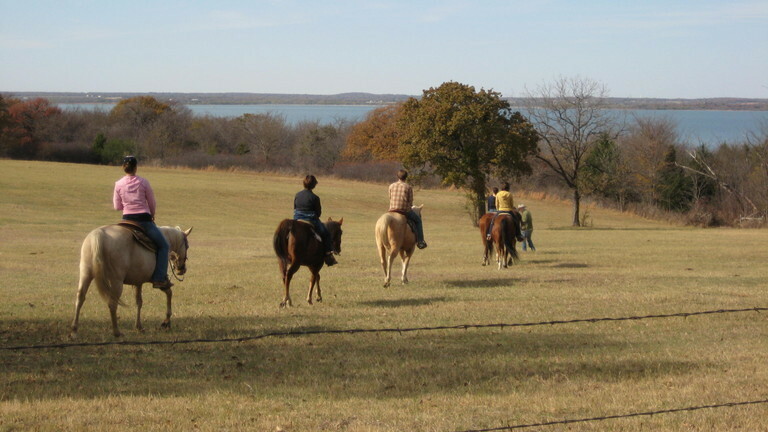 ♦Trail Rides - We offer trail rides on the Lake Ray Roberts equestrian trail. These trail rides last two hours and take advantage of the beautiful, peaceful scenery and abundant wildlife this trail contains. Hills, trees, and some rough terrain make this ride challenging, yet fun. Part of this trail also includes some wide open space for optional galloping. Cost for this ride is $60 per person with a minimum of $180. ♦Summer Riding Camps - During the month of June we offer week long riding camps. Kids must be 6 years old to enroll. Camps are held Monday through Friday of each week. They begin each morning at 9:00 and end each afternoon at 3:00. Our day consists of a morning riding time, an afternoon riding time, horse related craft time, ranch related game time, snack times in the morning and afternoon, lunch, and swim time. Be assured that your camper will be tired at the end of each full day! The cost for a week of camp for one child is $375.00. Please see our enrollment page for more details and to sign up. Details are added in March for the June camps. For additional information on any of the above services, please call Chuck at 940.391.4293 .